It’s important to see a cholesterol screening specialist to check on your cholesterol levels. 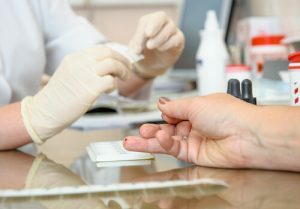 They can use a cholesterol test (lipid panel or lipid profile) to measure the amount of “good” and “bad” cholesterol and triglycerides in your blood. How often should cholesterol be checked? 1 in 3 Americans have not had their cholesterol tested in the past 5 years. The American Heart Association recommends having your cholesterol and other risk factors checked every four to six years after the age of 20. Those with cardiovascular disease or higher risk factors may need to be assessed every year. Who is at risk for high cholesterol? Triglycerides: When you eat, your body converts the excess calories into triglycerides, which are stored in your fat cells. People who are overweight, diabetic, eat too many sweets, or drink too much alcohol can have high triglyceride levels. If your level falls outside the normal range, you may be at a higher risk of heart disease, stroke, and atherosclerosis. Your doctor may order a blood glucose test to check for diabetes. Your doctor might also order a thyroid function test to determine if your thyroid is under-active. How do I check my cholesterol levels? Visit Manhattan Cardiology in New York to see one of our cholesterol screening specialists. During our cholesterol test, a small sample of blood is taken from your arm or finger. We then analyze the sample in our diagnostics lab. Take action and prevent the risk of heart disease, stroke, and atherosclerosis by having your cholesterol levels screened at our office in Manhattan.